Looking for a fun treat to make with your kiddos? 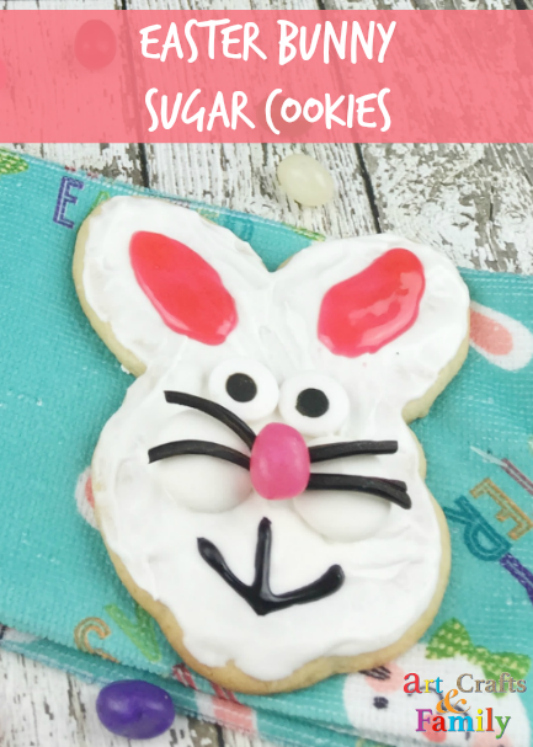 These adorable Easter Bunny Sugar Cookies Recipe is perfect. Little hands will love making the dough and being creative by decorating their own bunnies. With some icing, candy, and imagination, they will have the cutest bunny cookies around! In a mixing bowl, whisk the flour, sugar, baking powder and salt to distribute. Set aside. In a large mixing bowl, add the butter and sugar. With an electric mixer on medium speed, cream for 2-3 minutes or until light and fluffy. Add the eggs, one at a time and mix on medium speed until well combined. Add the vanilla and mix to blend. On low speed, add ¼ of the flour mixture and mix until blended. Continue to add flour, ¼ cup at a time, until all is mixed in. If needed, scrape the sides of the bowl to ensure all flour is mixed. Sprinkle 1 Tablespoon of flour on a hard surface. Place a large piece of dough on the hard surface and press down with your hands (or use a roller) to make it about ¼ inch thick. Using the bunny face cookie cutter, cut out bunny faces from the dough and place on parchment-lined cookie sheets. Repeat until all of the dough is used up. Bake in 350° preheated oven for exactly 10 minutes (any longer and they will turn brown). Let cookies cool in pans for 5 minutes. Line 2 cookie sheets with wax paper and set aside. In a double boiler, melt 1 tablespoon solid shortening. Add 1 cup white chocolate melts and stir occasionally until completely melted. Remove from heat. Let set for one minute. Pour the melted chocolate on top of each cookie (I just used a Tablespoon), covering the entire top. Lay cookies on wax paper lined cookie sheets to "set" for at least 20 minutes. Pour any remaining melted chocolate into a small microwave bowl to use later in the recipe. Cut licorice wheels into 24 strips for the whiskers. (8 strips per wheel). Set aside. Once cooled, pipe colored icing on the ears of each cookie. Microwave the remaining chocolate from step 4 for 30-40 seconds until melted again. (It will have hardened during the downtime). Dip the end of a toothpick into the melted chocolate and place on the back of both candy eyes. Gently press the candy eyes onto each cookie. Dip the end of a toothpick into the melted chocolate and place on the back of two white chocolate melts. Press the 2 melts into each cookie, right underneath the set of eyes. Leave a ½ inch space between each for the nose. Add about ½ teaspoon melted chocolate between both white melts on the bunny face. Insert 4 licorice strips (2 on each side) into the melted chocolate and place a pink jelly bean on top for the whiskers and nose. Hold in place for 30 seconds so they adhere to the chocolate. With the black decorating icing tube, pipe on the smile for each cookie.